Kindle Fire HD is meant to be a device you use to consume media, meaning that you can play/read all kinds of music, movies, TV shows, podcasts, e-books, audiobooks, magazines, and newspapers. Amazon has built up a huge amount of content, from print to audio books (more than 22 million) to movies, TV shows, songs, books, magazines, audiobooks, apps, and games. Kindle Fire HD enjoys the same kind of easy download capability as other Kindle devices have via Amazon’s Whispersync technology for books, audiobooks, music, video, and periodicals. Whispersync also helps sync items such as bookmarks you’ve placed in e-books or the last place you watched in a video across various devices. 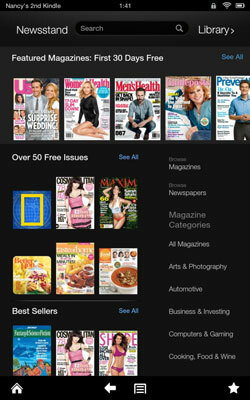 For example, say you have the Kindle e-reader app on your Kindle Fire HD, PC, and smartphone. Wherever you left off reading, whatever notes you entered, and whatever pages you’ve bookmarked will be synced among all the devices without you having to lift a finger. 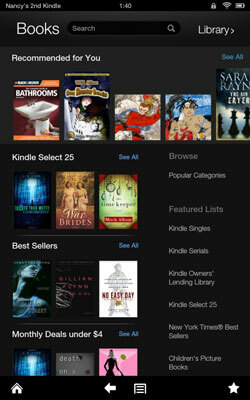 A great addition with Kindle Fire HD is something called Immersion Reading. This feature means that you play an audiobook and have the current word that’s being spoken highlighted in the text. This feature supposedly aids in reader retention, so it might be a nice match for those late-night study sessions with textbooks. Amazon continues to rack up deals with media groups such as Fox Broadcasting and PBS to make even more content available on a regular basis. Tap on a library — such as Books, Music, or Videos — on the Kindle Fire HD Home screen, and you can find various kinds of content in the Amazon store by tapping the Store button. Tap Newsstand to shop for periodicals and Music to shop for songs and albums, tap Video and you go directly to the Amazon VideoStore, and tap Apps to shop the Amazon Appstore. All the content you purchase is backed up on the Amazon Cloud Drive. When you own a Kindle you can take advantage of the Kindle Owner’s Lending Library, where you can choose from over 190,000 books to borrow at no charge for as long as you like. If you have an Amazon Prime membership, you can also get one free book a month for your permanent library. If you’re concerned about kids who access content over your Kindle Fire HD, check out the limitations you can place using Parental Controls. You can also transfer documents from your computer or send them via e-mail and read them on Kindle Fire HD or share them via the Amazon Cloud Drive. Note, however, that docs aren’t backed up in Amazon Cloud Drive as music, books, and videos are.